UK synth-rock pioneers revive golden-years lineup, make startlingly good album. A most welcome surprise, this one. The Ultravox lineup of Midge Ure, Billy Currie, Chris Cross and Warren Cann – the men at the wheel during the band’s commercial peak – have just released Brilliant, the first album since 1994’s Ingenuity and the first album these four have made together since 1984’s Lament. Lazy types might view this news with a shrug and a snarky one-liner about another ’80s band who refuses to let it go – as if that is some sort of obligation – but anyone familiar with the band’s work knows that the musical climate was beginning to turn in the band’s favor just as they were coming undone. Had they held on for just a little bit longer – one more year, even – Ultravox could have been part of that wave of established UK hitmakers (think Depeche Mode, the Cure, Echo & the Bunnymen, New Order and the Smiths) who saw their status in the States go from cult act to modern rock godfather in a matter of months. In short, Ultravox missed out on a grand opportunity, not to mention a hell of a lot of money. So is that what Brilliant is, a cash grab? Honestly, it could be. You have to think that Ure and the boys were both flattered and a little incensed when Muse lifted entire chapters from the band’s playbook and achieved massive worldwide success in the process. (Listen to the drum beat that opens Muse’s “Guiding Light,” and try not to sing “Vienna” on top of it.) 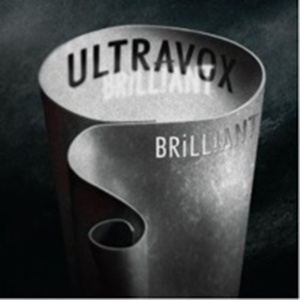 Having said that, it’s not as if Ultravox has changed their sound one bit in order to adapt to the times; indeed, Brilliant contains all of the sonic trademarks of the band’s best-known work, yet it sounds remarkably contemporary at the same time. One of the shrewdest things the band does on Brilliant is the near-perfect synthesis of the various production techniques the band employed between 1980 and 1984. Several tracks, including the title track and the goosebump-inducing “Live Again,” recreate that distinct snare drum hit that propelled Vienna tracks like “Passing Strangers” and “All Stood Still,” while “Flow” and “The Change” highlight the more symphonic approach of the band’s George Martin-produced Quartet. Currie’s violin gets a workout on “Satellite” and “Contact,” while “Rise” unleashes a keyboard solo akin to the one that anchors “Hymn.” That’s a lot of self-referencing, yet none of it sounds self-congratulatory; the songs remain the focus, and considering the group hasn’t written together in over 25 years, that they cooked up a batch of songs this good is damned impressive. Ure has lost a little off the top of his once-soaring tenor, but apart from that, Brilliant is vintage Ultravox, deftly blending pop hooks with operatic levels of melodrama. The only problem with an album like Brilliant is that now people are going to want another one. Let’s hope the band is up for the challenge.